In 2005 overtures by the AMNRL and rugby league supporters drew the interest of some local rugby union players, and a local union club, the Boston Irish Wolfhounds, fielded a rugby league side that joined the AMNRL on a trial basis. The Wolfhounds played an abbreviated two-game exhibition schedule to build interest in the sport in Boston, with the intention of playing a full schedule for the 2006 season. The next year the team ended its association with the Wolfhounds, adopting the name Boston Braves. They played through the 2006 season, winning only one game; they suspended operations at the end of the year. 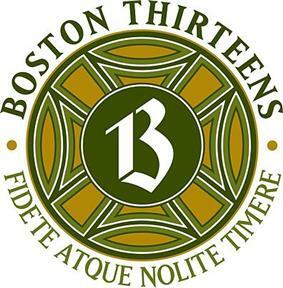 In 2009 a new leadership group led by Mikhael Nizam Shammas established a new team, which was named the Boston Thirteens. The club was incorporated as a C corporation (under the name of the "Boston 13s RLFC, Inc.") on Friday, February 13, 2009, and began play in the 2009 AMNRL season. They went to the playoffs that year, advancing to the semi-finals before being defeated by the Jacksonville Axemen. They failed to qualify for the playoffs in the 2010 season. On January 12, 2011, the Thirteens became one of seven teams to depart from the AMNRL to found the new USA Rugby League. The new league began in 2011. The Thirteens finished their first season in 6th place, not qualifying for the play offs. They only achieved two victories, both over their Boston rivals Oneida FC. The team was named the 13s reflecting the 13 original colonies of America, the thirteen players on the field in rugby league, plus the fact that the club is the thirteenth RLFC to be founded in the United States. For their inaugural season they adopted the colors of black and gold, and white and gold, with a logo incorporating the number 13 and a stylized Metatron's cube in the shape of a rugby football. In 2010, and in conjunction with the re-branding of the American National Rugby League logo and those of all affiliated clubs, the Thirteens adopted a new logo which depicted the numeric symbols of "1" and "3" merged to form the letter "B" for Boston. Additionally, the color of British racing green was added to the existing colors of white and gold, reflecting the Boston area's strong Irish heritage. ^ "Boston Irish Wolfhounds Join AMNRL". American National Rugby League News. amnrl.com. 2005. Retrieved January 20, 2011. ^ "The Boston Braves announce sponsorship deal with Budweiser Select". American National Rugby League News. amnrl.com. 2006. Retrieved January 20, 2011. ^ "History". boston13s.com. 2009. Retrieved January 20, 2011. ^ Francine King (August 20, 2009). "Jacksonville Axemen trying for bid to Rugby League title game". ^ Mascord, Steve (January 12, 2011). "Discord 2011: Edition 2". rleague.com. Archived from the original on 2011-01-19. Retrieved January 13, 2011. ^ "New Rugby League Competition Announced". rugbymag.com. Rugby Magazine. January 12, 2011. Archived from the original on 2011-01-19. Retrieved January 13, 2011. ^ "Breakaway league launched in the US". code13rugbyleague.com. January 12, 2011. Archived from the original on 2011-01-19. Retrieved January 13, 2011. Florida, USA Rugby League, New York, Pennsylvania, Washington, D.C.